For 30 years, Robert Ludlum's novels have set the standard for the finest in international intrigue and suspense. With an unbroken string of bestsellers in almost every country in the world, Ludlum's books have been read by hundreds of millions of readers, and are acknowledged as classics in the field. 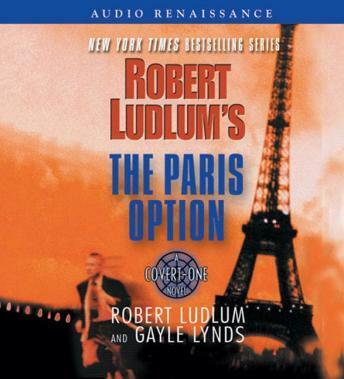 Now, after the bestselling The Hades Factor and The Cassandra Compact comes the third thrilling novel in the Covert-One series - Robert Ludlum's The Paris Option. An explosion in the middle of the night reduces part of Paris' esteemed Pasteur Institute to rubble. Among the missing is the world's top computer scientist, Emile Chambord. Even though a terrorist group claims responsibility for the bombing, many in the intelligence community suspect the scientist was actually kidnapped and the bomb set to divert attention. Chambord may have been close to devising a working molecular computer which, in the wrong hands, could be the most deadly weapon in the world. If he were now in the hands of hostile forces, the consequences would be unspeakably dire. From Paris to London, Brussels, and Algiers, Covert-One agent Jon Smith searches for traces of the scientist and the ambitious forces behind the bombing and theft. With the help of MI5 agent Peter Howell, CIA agent Randi Russell, and cyber-wizard Marty Zellerbach, Smith uncovers a web of deception that threatens to reshape Europe and is one step away from destroying the United States. Wonderful Book. One of my favorite authors... but the quality of the recording is terrible and there are multiple parts that skip really bad. I contacted customer service about it and they were wonderfully helpful to me. Hopefully they can get the recording repaired and then I would give it 5/5 for both categories.